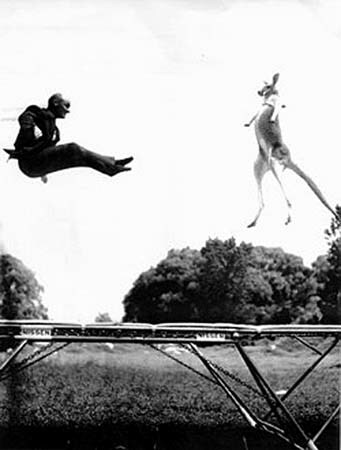 On April 7, 2010, the world lost George Nissen, the inventor of the first modern trampoline. Nissen was a beloved member of the gymnastics community and was best known for his great passion for trampoline sports. Nissen invented the trampoline after he observed trapeze artists use their safety nets as a tool to rebound and perform additional gymnastic feats. In a brilliant revelation, he realised that this would be a fantastic training tool for gymnastics coaches and students. His trampoline invention was immensely successful, and he toured the United States and Mexico performing at arenas and carnivals. Nissen promoted the trampoline for most of his life and was a strong presence in trampoline and gymnastic centres. Nissen was also famous for the wacky portraits depicting him bouncing on his trampoline in unusual circumstances. Perhaps the most famous, one of these pictures features him bouncing on a trampoline with a kangaroo. Another notable portrait is that of him using a trampoline that was placed on the Egyptian pyramids. Mr. Nissen lived to the age of 96 before succumbing to complications from pneumonia. He will be fondly remembered. Read more here about the history of trampolines!